“Whoa, what is that?” says my coworker, Dan, looking at the brightly colored, squiggly structure on my computer screen I’m flipping and tugging at with clicks of my mouse. “It’s a protein. I’m playing Foldit,” I reply, clicking and dragging on a blue sidechain to eliminate the red spiky “clash” ball between it and another sidechain and watching my score jump. I explain how it’s a video game where the time you spend playing can actually help advance scientific discovery. “That’s so cool. Can you send me the link?” he says. And, within five minutes, another Foldit download completes and another layperson researcher has logged in, ready to contribute to cures for cancer or Alzheimer’s or HIV just by playing a video game. 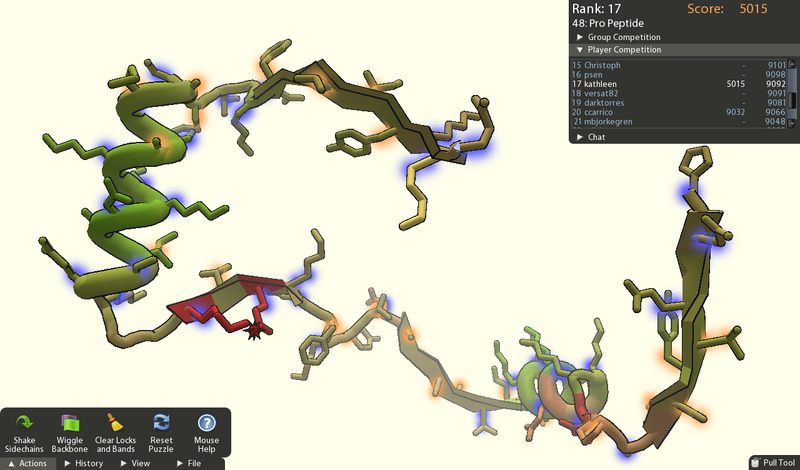 Foldit is a rather addictive, but challenging, game that turns protein folding into a human competition (or collaboration, depending on how you play). 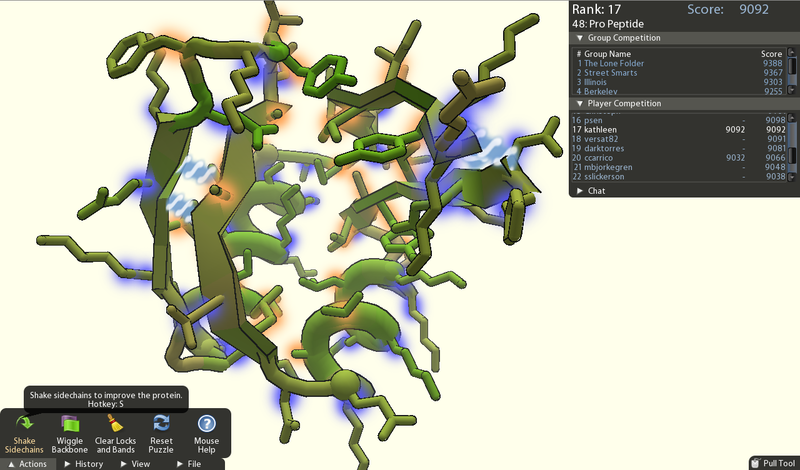 After downloading a small desktop application, players all around the world can log in, start up a protein folding “puzzle,” and use their mouse and keyboard to manipulate an amino acid chain into its most stable, lowest-energy shape to minimize internal stresses and keep the amino acids positioned appropriately within the protein blob. The rules of Foldit are simple: they’re the laws of physics by which protein strands contort into three-dimensional shapes to enact their specific biological function. The Foldit website summarizes it nicely as: pack the protein; hide the hydrophobics; and clear the clashes. A player’s reward is points, community recognition and personal satisfaction of contributing to scientific discovery. And it’s important work. Though current players are still working on known proteins to prove that humans can fold proteins as or more effectively than computers, Foldit’s ultimate goals are protein structure prediction — key to knowing how to target a protein with drugs — and protein design, which could lead to brand new proteins that could help prevent or treat diseases. Foldit is based on a 2004 predictive protein structure distributed computing program called Rosetta, developed by University of Washington professor David Baker. Thousands of people uploaded Rosetta to their home computers as a screensaver, where they could watch as it used idle cycle times to methodically tug and twist various proteins, looking for better configurations. What was surprising to Baker was that people started writing him complaining that the computer was moving too slowly and picking silly configurations and that they could immediately see how the protein could be folded better. Seeing an opportunity, Baker started collaborating with computer scientist peers and it was only a matter of time before Rosetta became Foldit: the “research tool disguised as video game” that over 200,000 players have registered to play. What’s really cool is that you don’t have to be a scientist to be good at this game. Foldit capitalizes on our natural human intuition for spatial manipulation and problem solving. At one point, the top five solo players each reported no more than a high school level biochemistry background. In fact, most of the players aren’t scientists. But they’re nevertheless doing a great job. An August 2010 Nature article presented evidence that top-ranked Foldit players can fold proteins better than a computer. So, what are you waiting for? Go download Foldit and get to folding those proteins. Cancer’s not going to cure itself! “Want to help cure diseases? Play Foldit!” Boonsri Dickinson. Smart Planet. August 5, 2010. “Foldit game engages the public in research.” University of Washington Engineering. Autumn 2010 issue.